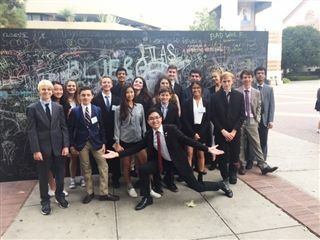 Model U.N. headed to UCLA for the BruinMUN conference on November 10. At the weekend-long conference students participated in a diverse range of committees, such as the Peloponnesian War and the rights of female refugees. Sophie Schmidter ‘21 won a Research Award in her committee representing the Russian Federation. Mary Fangman ‘20 earned a Commendation for her role as a French fur merchant in the Beaver Wars Committee. Emil Halliday ‘20 and Haitong Du ’18 both won Best Delegate as Armenia in the UNESCO committee.